Paying Back TARP: Good for Banks, Bad for Investors? 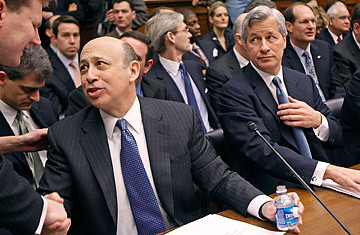 Goldman Sachs chairman and CEO Lloyd Blankfein, left, and JPMorgan Chase & Co. chairman and CEO Jamie Dimon join other executives from financial institutions that received TARP funds to testify before the House Financial Services Committee. Will investors regret rooting for TARP paybacks? Recently, Goldman Sachs, JPMorgan and others have said they plan to repay the tens of billions of dollars they received last fall as part of the government's Troubled Asset Relief Program (TARP) as soon as possible. Investors immediately cheered the news. Shares of Goldman and JPMorgan are up 80% and 117%, respectively, since the market bottomed in early March. What's not so clear is whether repaying TARP will turn out to be beneficial for investors. Analysts say getting out of TARP could be costly. Indeed, some worry that banks are putting their desire to rid themselves of government intervention ahead of their firms' bottom lines. "TARP funds are a relatively inexpensive way to fund your operations these days," says Ray Soifer, a former top Wall Street analyst and a longtime bank consultant. "The problem I see is that banks are rushing to save every penny and nickel in order to pay back TARP instead of lending, which is one of the ways they make money." Now the government has said that even banks that passed stress tests will not be allowed to pay back TARP funds until they can raise money on their own. Some banks have been able to venture out into the market on their own, but the rates they are now paying investors  without government backing, that is  are significantly higher. Analyst Brad Hintz of Bernstein Research estimates that JPMorgan, one of the healthiest banks, will have to pay three percentage points more per year to borrow without the FDIC guarantee. That would boost the interest JPMorgan has to pay on five-year loans to 6%, from an FDIC-backed rate of 3%. For Goldman, the cost of borrowing could rise as much as five percentage points to 8%. That could translate into a lot of money. In the past six months, the nation's largest banks have raised just over $225 billion using government guarantees, according to Thomson Reuters. Had the banks had to raise that money on their own it would have been much more expensive. Morgan Stanley, another bank that has reportedly been looking to pay back TARP funds, has raised $23 billion in FDIC-backed debt since the program began in November. Hintz estimates the government's help is allowing Morgan Stanley to lower its borrowing costs by 5½ percentage points. That would have raised Morgan Stanley's expenses by nearly $1.3 billion a year. And that is just the money it has borrowed in the past six months alone. Banks exiting the TARP program are also looking to buy back the warrants they issued to the government in order to receive TARP funds. David Hendler, an analyst at CreditSights, estimates that it would cost JPMorgan nearly $2.6 billion to buy back their warrants from the government. "Banks may have to spend substantial sums to pay back their TARP warrants," says Hendler. Proponents of the banks paying back the government say the higher borrowing costs will only be temporary. As the market improves, banks will be able to issue bonds on their own at lower rates. Indeed, so-called bank credit spreads  the extra costs of borrowing  have already begun to fall. What's more, if the banks buy back the warrants now, while bank stocks are still relatively low, it could be much cheaper than waiting to do it once the share prices have recovered. "I think it's worth the cost," says Hintz. "The only way it will turn out to be really expensive is if the economy never recovers." Still, the high costs of being TARP-free are causing some banks to say that for the time being they are better off with the government funding than without it. PNC Financial's chief executive Jim Rohr recently told Bloomberg that his bank, which got $7.6 billion in TARP funds, is planning on taking its time to repay the government. Doing anything else, he said, "would be punitive to shareholders." Investors in Goldman and JPMorgan may find that out the hard way.